Lock in a great price for Design Suites Calafate – rated 8.1 by recent guests! This is a great hotel, nicely designed, in front of the lake (Lago Argentino), with good facilities. Rooms are large and comfortable. So is the bathroom. Lake-view rooms are a must. Connecting rooms are available for families. It has an indoor heated swimming pool with a view to the lake. Probably the best choice for family travel in El Calafate. (This was my third stay there). Very good value for money, even in the high season if you are able to make reservations with 4-5 months anticipation, as I did. The design of the hotel is beautiful and the view you have in front of the Argentino Lake and the Andes as well is just breathtaking. Staff people are very kind and helpful. Very kind and helpful staff. Panoramic view of the Lago Argentino. Miss Verónica at the restaurant. The view and the design was perfect. The staff was so welcoming and friendly. Good breakfast. Beautiful structure away from the town which meant it was quiet and had a gorgeous view. Good bang for my buck. The location and set up of the rooms is great and provides excellent views of Lago Argentino. As well, staff were really nice and kind enough to let me charge my phone at their desk even after all the plug converters were rented out. Wait staff at the restaurant were also kind and the food was great. I would definitely recommend this hotel with all the features and accommodations. Design Suites Calafate This rating is a reflection of how the property compares to the industry standard when it comes to price, facilities and services available. It's based on a self-evaluation by the property. Use this rating to help choose your stay! One of our top picks in El Calafate.Offering an indoor swimming pool, a sauna room and spa facilities, Design Suites Calafate has chic décor only 1.9 mi from downtown Calafate. Spa treatments can be booked and there are gym facilities on site. WiFi is free. Rooms at Design Calafate are equipped with large windows allowing plenty of light and feature flat-screen cable TV. Some suites feature spa baths and scenic views of the lake. An on-site á la carte restaurant and a bar provide meals and drinks from the morning until late at night. Guests can admire the low vegetation, hills and lake of Nimes Peninsula. Guests can also browse for souvenirs at the on-site gift shop. Free uncovered parking is provided on site. 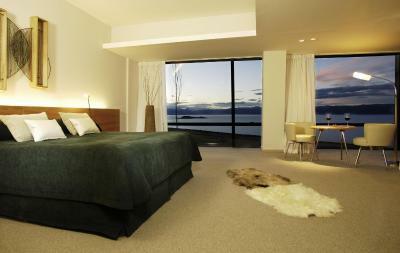 When would you like to stay at Design Suites Calafate? This room offers a private bathroom with a hydromassage tub and features a queen-size bed or 2 single beds, free Wi-Fi, heating, flat-screen TV, mini-bar, safety deposit box, telephone, desk, hairdryer and special amenities. This suite offers lake views, a private bathroom with a hydromassage tub, a queen-size bed or 2 single beds, free Wi-Fi, heating, flat-screen TV, mini-bar, safety deposit box, telephone, desk, hairdryer and special amenities. 1 extra bed can be accommodated. Children older than 3 years old signify a surcharge of USD 60.5 per night and per person, and must stay in an extra bed. This suite offers scenic views, a private bathroom with a hydromassage tub, a queen-size bed or 2 single beds, free Wi-Fi, heating, flat-screen TV, mini-bar, safety deposit box, telephone, desk, hairdryer and special amenities. 1 extra bed and a baby cot can be accommodated. This suite offers lake views, a private bathroom with a hydromassage tub, a queen-size bed or 2 single beds, free Wi-Fi, air conditioning, heating, flat-screen TV, mini-bar, safety deposit box, telephone, desk, hairdryer and special amenities. Located in the upper area of the Nimes peninsula, the rooms offer the greatest panoramic view of the Argentinean Lake. Every detail invites us to a magical world. House Rules Design Suites Calafate takes special requests – add in the next step! Design Suites Calafate accepts these cards and reserves the right to temporarily hold an amount prior to arrival. Note that free shuttles to and from the city center are available. These run twice a day. Children older than 3 years old signify a surcharge of USD 48.4 per night and per person, and must stay in an extra bed. Great views from the lobby. Our room did not have one though. Location is not practical if you don’t have your own car or are not part of a tour group. Center of town is too far to walk and food options in the vicinity of the hotel are very limited (none, really). There is a shuttle twice per day but the times were inconvenient for us. WiFi didn’t work because of a ‘problem with the provider’, we were there for 4 days and it looks like the provider didn’t fix the issue. They said it was a problem all over town because it was overcast that day but if I were them I’d look for a different provider because WiFi was working fine in the restaurants we visited. There was a very limited selection of flyers for activities or day trips in the lobby and none of the most popular ones. In combination with the WiFi problem and the distance from the town center we found this a problem because we only had the very short descriptions or even price lists from a folder of a local tour operator they work with to base our choices on. The design of the rooms is beautiful, but quality of construction and maintenance is lacking: the tv isn’t mounted straight, same goes for the bathroom tiles. The reading lights almost fell from the wall. Tiles in our bathroom were cracked and the spa bath + shower looked so gross we didn’t want to shower there much less use the spa functions. The carpet was stained and there was dust on some features near the ceiling. Location is beautiful, view of the lake is spectacular. Staff is friendly and helpful. Design of the hotel and its rooms is nice. Wifi was not working. Building maintenance is poor. Heating was little bad but ok.
We stayed for two nights and since we didn't find available the same room in both days, we made two separate reservations. Once arrived, we tried to keep the same room for both nights, but this wasn't possible. But we understood the situation, as the rooms were different categories. Great hotel situated in an excellent location, overlooking to Lago Argentino and El Calafate. The view is splendid, but you pay the price for not staying near the town center. But you easily order a cab or walk if you have enough time. Rooms are very big and spacious and they have an impressive design. The restaurant was also very good. Even if it doesn't have too many choices on the menu, the food was delicious and the prices were probably at half compared to the restaurants in the town. far away from the center, rooms are not sound proofed. Nice hotel in front of the lake, good view, nice swimming pool, good restaurant. Attention from the staff was above expectations, everybody very helpful and nice. Other than location being far from the town center, everything was great. Facilities in the room was good with its jacuzzi in the tub. Food at the restaurant was fabulous. Unfortunately the facility while looking at first glance very good it reveals for what it is: a poor quality construction. During our 2 night stay we had to change our room twice. First room was affected by bad smell, most likely coming from the drainage. The room have been scented abundantly to cover this but the smell was way too strong to go away. We asked for a change of room and we were immediately assisted even if it was late in the evening. We got assigned to another room that unfortunately had two more problems: 1) super high heating system that could have not been controlled by any system 2) a external light meant to lighten up the facade of the hotel that was pointing directly into our room! We spent the night with the air-con set to the max and all curtains sealing the big window (that was granting an awesome view during the day). The next morning we reported these issues to reception and left for our day trip. At return disappointingly no action was taken and only after our complaint we were assigned to a new room that was ok. While the hotel wants to look "design" style (as the name states), the fixtures are very cheap (thin plasterboard walls divide the room with no sound isolation, lamps and room fixture are maintained poorly) and in general gives an idea of being poorly maintained (we understood from the staff that was trying to be helpful that will now go under renovation). We have been offer a discount on our expenses during our stay as compensation for the inconvenience, which we appreciated but we really hope that the management will put more attention in the future to offer a proper experience to its customers. Location is stunning- fantastic view of the lake. Swimingpool water has white film, mossaics are coming out, mold everywhere, carpet in the room dirty and off the ground. This used to be a nice hotels 10 years ago. I am very dissapointed about this place! Very strange place! Great views, good food and breakfast, friendly staff....horrible facilities. The hotel is poorly constructed and not maintained enough. Wi-Fi worked occasionally, windows and door to the balcony did not, some drainage issues in the bathroom. Nothing that we did not like. The room we had definitely exceeded our expectations in all areas! We had a stunning breathtaking view of Lago Argentino from our room! This is by far the best room we've had on vacation! It was the highlight of our trip! Such a spacious, clean, and comfy room. The tub is so big with massage jets perfect to take a delicious warm bath after a long day of excursions appreciating the beautiful sunset from your tub! The mini bar was perfectly equipped! we also enjoyed the pool and spa area downstairs! very nice pool overviewing the lake as well! Staff was incredibly helpful and attentive. We had an amazing and romantic dinner again with the view the night before we left. Food was so delicious and the service we received made for a memorable night. Breakfast was also on point, a variety of options to choose from. Everything looks nice until you look closer or you touch something. The sink in the bathroom is design ok, but if the water isn’t draining, after 30 seconds it floods. The AC/heater is a joke, it looks new, but makes a lot of noise and doesn’t heat at all. Both the night lamps were completely loose and one fell off, but we screwed it back on. The faucet in the bathroom.. loose too.. we paid a last minute price, so it was ok value for money.. but if we would have paid the full listing price, definitely not worth the money! Comfortable beds and the view from the restaurant is excellent.